How does nutritional status affect plant immunity and disease? I am doing a PhD with NIAB-EMR and the University of Reading. I studied an Undergraduate degree in Environmental Sciences at the Universitat de Girona (Spain) and a Post-Graduate Diploma in Conservation of Biodiversity at the University of Kent. After university, I worked in the forestry sector for two years, focusing on seed dormancy and germination. The title of my PhD is “Understanding the mechanisms of apple dormancy break in the context of climate change”. In the UK, climate change projections predict an increase in temperatures and in the frequency of extreme weather events. For apple production, this translates into a longer growing season with higher chances of frost due to early flowering and a shorter chilling period. 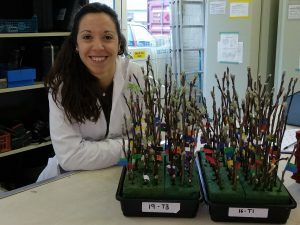 Insufficient chilling can contribute to the absence or delay of bud break and the production of smaller and abnormal fruits, having a huge impact on apple production. A modelling approach is required to anticipate climate change impacts on dormancy break. The overall goal of this PhD is to develop a new chilling model for apple, which will be used to advice growing practices and guarantee future apple production in the UK.